A while back, I received a box of sample items from EasyLunchBoxes for me to do a review. I had meant to post this months ago, but they went out of stock and so I decided to hold off on this until now. I had heard of these boxes on Twitter, because for a bit, anyone tweeting about bentos immediately got some kind of reply tweet about them. I took a look and after determining that it seemed like overpriced Ziploc containers trying to get in on the bento craze, I decided to pass. A complimentary set of items for review, however, is something I will gladly do. By now I’m sure you guys know, I’m not afraid to be honest just because I got a freebie. 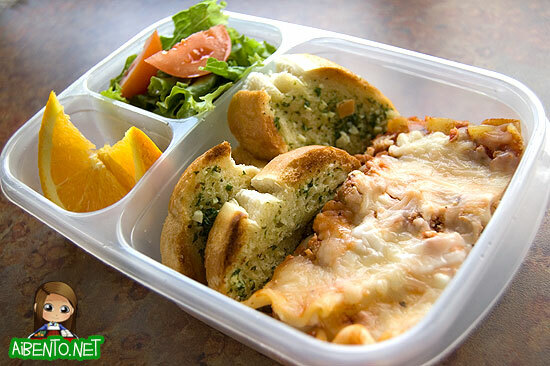 I feel ashamed to admit it, but even months later, I have still some bento snob in me and prefer to call these “home lunch boxes” instead of “bento boxes”. Anyway, moving on. First off, I have to apologize for the photo because this one was taken with my phone. I busted out my Nikon to take a nice photo only to remember that I’d killed my battery by leaving the camera hooked up to my work computer the other day so that I could edit some office photos. So, phone it was. My P&S was dead too. The other photos were taken when my camera wasn’t quite so non-functional. Read on for my review and a giveaway! I made a sandwich for this first lunch because these containers are obviously made for packing sandwiches. I packed lettuce on the side to put in before eating and also stuffed in some veggie sticks. 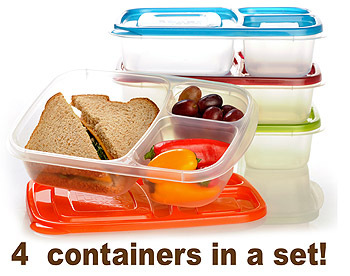 The containers come with two side dish containers that are completely separated. I put more veggie sticks in one and a single serving of hummus in one side and grapes in the other. A fairly straightforward lunch. The containers in general look pretty standard, like plastic Ziplocs with separated areas, but are much sturdier than your regular supermarket containers. The lids come in a variety of colors (all imprinted with the logo and URL) and snap on pretty nicely, but if there’s any amount of hard food (like grapes) over the little ledge inside each area, the lid can pop off. This is easily solved with a rubber band or bento strap, but I don’t think the boxes come with its own. At least, I didn’t find any in my sample box. This was a rather hastily thrown together lunch for Mr. Pikko, but that’s a good thing in the morning when you’re in a big hurry. This has lasagna, garlic bread, some orange slices, and a small green salad that I made by just ripping the lettuce apart. I had to trim the orange slices some to make the lid fit on. As you can see, it fits a good amount of food, just a bit smaller than a standard too-much-food plate lunch. In this last lunch, I decided to go a little fancier to see how a pretty bento fared in the box. I made star sammies with lettuce border and orange slices for garnish. In the side containers, I put grapes, a fruit by the foot, an a lychee jelly. These are Baby Girl’s favorite things, but unfortunately she’s in a “meat phase” right now and the bread and lettuce all came back. I asked her what she ate first and she said the lychee jelly. 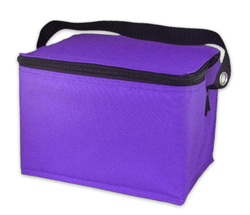 Easy Lunch Boxes also sells lunch bags, which have light insulation and the containers fit inside perfectly. They are priced at $7.95 and are pretty sturdy, as I’ve carried all of my lunches to work for about a month now and haven’t had it break on me. I swung it around to give it some wear and tear and it still held up nicely. You can fit more than one lunch container in there, but if you only use one and an ice pack, that works too. Anyway, I was quite pleased with the amount of food I could pack into the container for a field trip. Plus, since the containers are hardy, but not all that precious in the looks department, so I wasn’t too worried about Baby Girl bringing it back with scratches or mud stains on the bag. I usually get all frantic if she brings back my bento box with scratches and food spilling into her backpack. Since I liked the product and use it a decent amount, I have no qualms about recommending it to moms looking for a good container to pack home lunch in, for younger kids, older kids, or for husbands. I don’t think it’s a good container for a more typical bento lunch (with onigiri and meat and veggies) for younger children (around preschool to first grade) as it’s actually a little too big and you would probably have a hard time filling it unless it’s a sandwich. I need to give it a try with rice before I can give an accurate verdict on that though. Kids with growing appetites would probably do well with a box this size for bento, especially boys, since it doesn’t look cutesy or girly, but can still pack a lot of food. 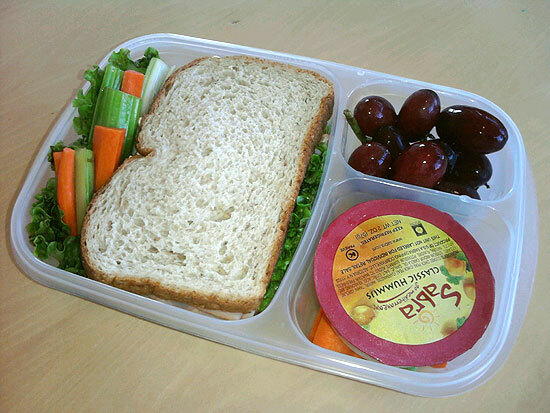 Easy Lunch Boxes sells the containers 4 to a set for $13.95, which makes each container around $3.50 each. They stack within each other, which is good for storage, and they’re dishwasher safe. They fit in my bottom rack along the sides, though mine came out with those ugly soap circles on them and I had to rinse them again. This is probably my dishwasher’s fault. 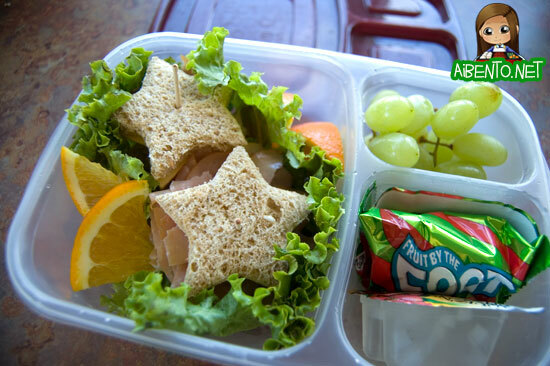 In addition to providing me with samples, Easy Lunch Boxes has also agreed to sponsor a giveaway. To enter, simply comment and tell me which of the three lunches I made for this review you liked the best, and what you would pack in one of these if you won. Deadline to enter is Friday, December 3, 2010.